Referred to as acupuncture face-lift. Its a great way to delay the sign of Aging. ” A viable alternative to cosmetic surgery, the effects of which run deeper than simply improving appearance” – The Irish Times (2003). Cosmetic Acupuncture is a non-surgical, holistic approach to facial rejuvenation. It goes back thousands of years and can enhance not only your physical appearance but also your overall health. Acupuncture is far less expensive, more natural, non-invasive and safer than plastic surgery or botox injections and has no side effects, toxicity, inflammation, or recovery time. Cosmetic Acupuncture has become the Facial Rejuvenation Treatment of choice for many celebrities, including Sandra Bullock, Gwyneth Paltrow, Jennifer Anniston, Madonna and more. “I have been a big fan of Chinese Medicine for a long time because it works ” – Gwyneth Paltrow. The first is that it works really well , whilst being completely natural with no side-effects. Helps to eliminate fine lines of the face and has a diminishing effect on larger wrinkles. It tightens the skin and the pores, improves muscle tone, and dermal contraction, and improves facial colour. It reduces bags under the eyes, and decreases the tendency towards sagging. Helps to lift drooping eyelids and brighten the eyes. Helps to eliminate puffiness by improving metabolism, and thus eliminating excess fluids. It improves the health of your whole body, not just your skin, it really is beauty from the inside out. It is very relaxing, and will help ease any stress or anxiety you may be experiencing in your day to day life. Stress can cause us to age prematurely, by blocking the flow of energy and blood around our body. So Acupuncture works in several ways for us to have more healthy and youthful-looking skin. Brings out a persons innate beauty and radiance, and slows the aging process. The results of a ten session course are long-term , with just minor tune ups, every 4 months or so. There is no recovery time needed. You will be able to carry on with your day after a treatment. Acupuncture is effective in treating acne and eczema. Diagram : Some Areas that Cosmetic Acupuncture work on. 1. Acupressure : This is a gentle massage on acupressure points on the face. Increases the supply of Oxygen and Nutrients to the Face. 2. 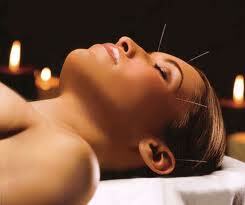 Acupuncture : This involves the placement of very fine needles in certain points on the body and face. Lifts Sagging Jowls and Eyelids. 3. 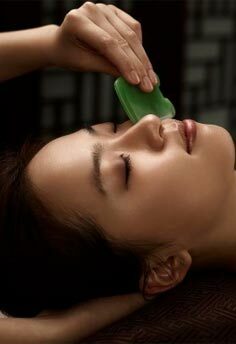 Gua Sha Therapy : This involves massaging of the skin using a special Gua Sha tool. Increases skin radiance creating a lustrous rosy complexion. Improves elasticity of Facial Muscles. Your first Cosmetic Acupuncture treatment will include a consultation in order to identify any health issues which will be addressed with the treatments. Lifestyle and Nutritional advice will be given in order to Maximise Results. A course of Cosmetic Acupuncture consists of 10 to 12 sessions which can be taken once or twice weekly. A follow up treatment , once every 3 or 4 months is recommended in order to maintain results. 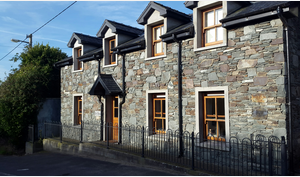 A course of 10 treatments : €650 (€200 to be paid on first treatment , and €50 at each remaining treatment).